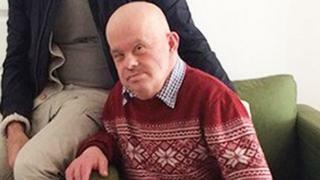 A man who had Down’s syndrome died of pneumonia days after his family raised concerns about a hospital’s care for him, an inquest has heard. Giuseppe Ulleri may have gone 10 days without food at Manchester Royal Infirmary (MRI) before his death in 2016, the city’s coroner’s court heard. The court was told he had struggled to ingest food given through a tube. Peter Ulleri told the jury he had warned staff there was an issue, telling them he “could die from this”. Coroner Angharad Davies said the 61-year-old’s condition meant he had difficulty communicating and looking after himself. Jurors heard Mr Ulleri was found on his bedroom floor on 26 February 2016 by care staff. The court was told scans at MRI did not show any significant injuries, but he was readmitted the next day after having difficulty walking and swallowing. Subsequent X-rays revealed fractures to his neck, hip and wrist. The coroner said for medical reasons, he was made nil by mouth and had a feeding tube inserted on 9 March, but it was removed a day later as he found it uncomfortable. Peter Ulleri told the court that it was later agreed a tube would be inserted into his brother’s stomach on 18 March. He added that the delay in giving nutrition meant the 61-year-old, from Withington, was too weak to recover from the procedure and he died two days later.